Need a fun but simple dessert? 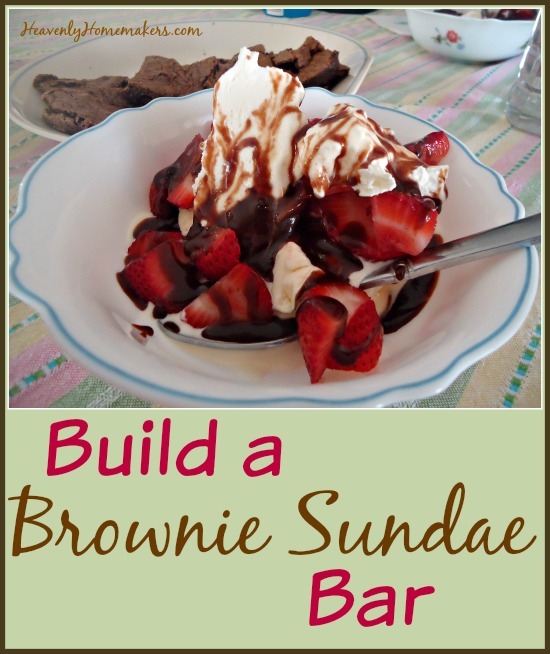 This Brownie Sundae Bar is the way to go! Sunday morning before church, I baked some Brownies and sliced some strawberries. Those two items alone make a dessert pretty special. 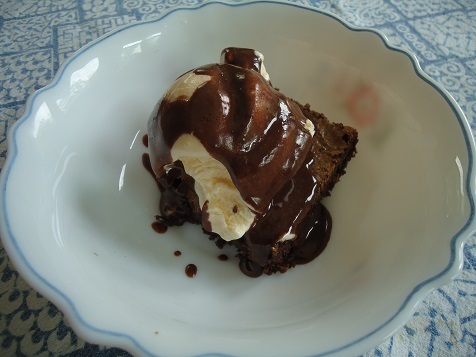 Once we arrived home from church, I made some Homemade Hot Fudge and whipped some cream. Thus (I like saying “thus”) – after we cleared the table of the wonderful (and also simple) Easter dinner, the boys helped me carry all the fun brownie bar goodies out to the table. As each item appeared on the table, our guests (5 college students) gasped – especially when the hot fudge came out. It was like I had spent hours on a fancy dessert and presented them with a one-of-a-kind treat. Dude, it was just brownies and ice cream. But hey, when you put all these simple treats together, they really do make something special. So the moral of this story is this: If you need a special dessert for company, but you don’t have a lot of time, consider preparing a Brownie Sundae Bar. Your guests will love it and you will too. It’s simple but fancy and obviously delicious. What else would you add to your Brownie Sundae Bar? This looks like a great idea for a birthday party, especially for those of us who aren’t into cake! I’m thinking I would make some homemade caramel topping as well. Fudge + caramel + peanuts + ice cream = Snicker’s Sundae! Mmmmmmm!!!! Looks delicious, but it would HAVE to have nuts if I was eating it, preferably almonds! I will probably steal this to use this summer with our teens. I am always trying to find yummy and easy snacks for Recharge, a Bible study we host and Sunday night youth group. Mitch makes a great homemade caramel sauce, so I would include that for sure! Does the hot fudge sauce come out tasting dark or could I cut the sugar to get it tasting more like dark chocolate? (If so by how much?) I prefer dark chocolate and my favorite hot fudge sauce recipe has unsweetened chocolate and a minimal amount of sugar. About how many does 1 batch of your sauce serve? I love my recipe, but it requires 2 Ghiardelli baking bars and Cocoa is SO much cheaper.